Grant Wardell-Johnson, from Curtin University, Australia, has visited us for a couple of days. He was interested in big mediterranean trees. 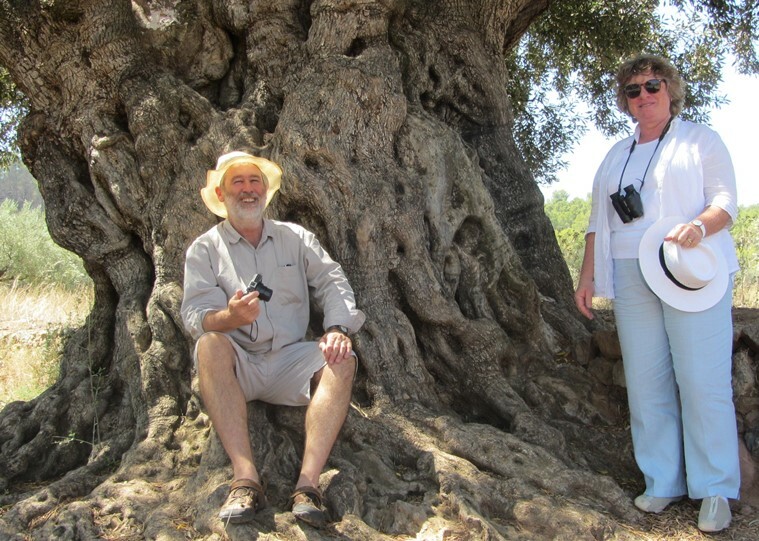 Here is a picture of him and his wife Angela next to a 1500 year old olive tree near Valencia (la olivera morruda, Segorbe, Spain). 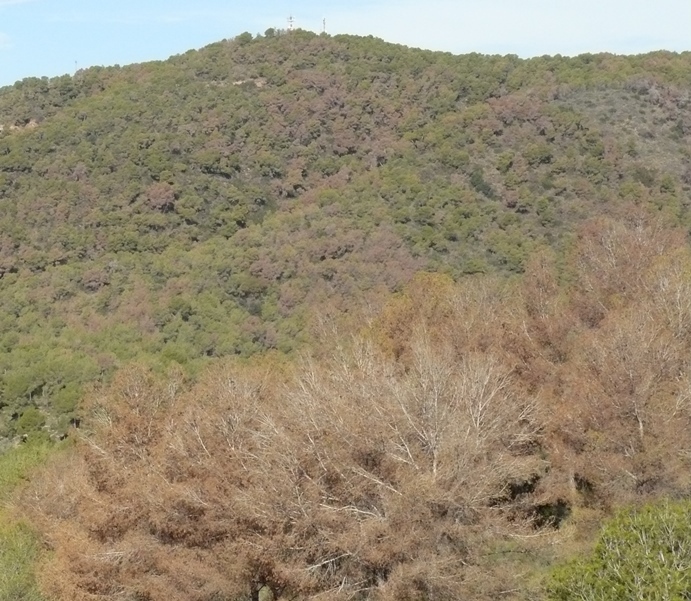 They also met big Juniperus trees in Ademuz, cork oaks (Quercus suber) in Espadà, and pines (P. halepensis, P. pinaster) in Calderona and Espadà; all near Valencia. Climate warming is increasing water stress in many ecosystems, with consequences of increased plant mortality and susceptibility to pests (Figure below). However, there are other mechanisms (climate-independent mechanisms) by which plant drought stress can also increase. In a recent paper , we use a water balance model coupled with a vegetation model, to simulate changes in leaf area (LAI) and evapo-transpiration between two forest inventories in NE Spain. The results suggest that during 1980-2010 there was a tendency of increasing in drought stress for most tree species; however, drought stress was not predicted to change when considering that forest structure did not change between the two forest inventories. That is, changes in climate alone did not predict changes in water stress. In contrast, the recent increase in forests (in extension and in tree density) in the study area showed to be the main driver for the drought stress observed in trees. This forest increase is due to the abandonment of land and rural activities durint the recent decades [2,3]. That is land abandonment is not only increasing the fuel in the landscape (amount and continuity [2,3]) but also the flammability of this fuel. Consequently, land abandonment and increased forest is a major driver of drought and fire regime changes . Caution must be taken in extrapolating these results as they are based in a model; i.e., more information from other approaches and places is needed. However, it is clear that climatic change should not be considered the only source of current drought stress in vegetation; there may be changes in drought stress as well changes in fire regime that are climate-independent [1,4] and more related to changes in forest and landscape structure linked to factors like socio-economic (and landuse) changes, changes in herbivores, plant invasion, etc… ; and in many cases, these different processes interact. The good thing is that climate-independent processes are easier to manage than climate! Figure: Plant mortality by drought stress in Calderona, Valencia, Spain (Photo: P. García-Fayos, 2015).